Wylee the border collie can search an avalanche the size of a football field in five or 10 minutes. It would take a probe line of 50 people using poles a couple hours to cover the same ground. When 30 minutes can mean the difference between life and death for a skier lost on a snowy mountain, most people would bank on the dog. "The fastest thing is a dog - faster than a beacon or echo," said Craig Noble, ski patrol and dog supervisor at Squaw Valley Alpine Meadows resort in Olympic Valley, California. "We respond to a lot of avalanches that don't involve any people. But we don't know that before we leave. We just get there and get the dogs working." Speed is crucial in avalanche rescues, with minimal chances of survival if victims are buried for 30 minutes or more. Noble skis 220 days a year by following the snow from California to Chile and Australia. 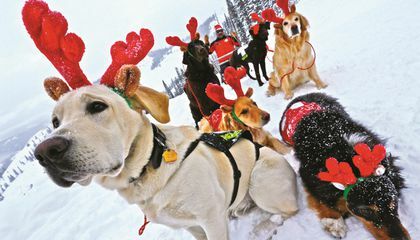 He also takes yearly classes from the Canadian Avalanche Rescue Dog Association, with trainings at Whistler Mountain in British Columbia among other locations. Noble relays what he learns to the ski patrollers at Squaw Valley Alpine Meadows (the site of the 1960 Winter Olympics) and Crested Butte Mountain Resort in Colorado. He's brought all of their dog programs up to the same CARDA standard. He also teaches classes for students in the mountain communities. "The kids love the dogs," he said. Every dog and handler must recertify as a team every year, he said, but before handlers get a dog to work with, they train for a year without one. "It's easier to teach animals than people," Noble explained. Wylee is 8, but he's fit and a lean 42 pounds, with plenty of time left in his career, Noble says. Most patrollers use Labradors or golden retrievers, but Noble opted for Wylee partly because he weighs about half what the other breeds weigh. Patrollers have to carry their dogs to search sites in addition to hauling 60-pound backpacks with shovels, probes, headlamps, water and other equipment. The dogs need the lift so they don't get tired before they start working. Dustin Brown, a ski patroller at Crested Butte, is going on his second year handling Moose, a Labrador retriever. Moose "comes to life in the snow. He feels free. It's playtime. There's a new adventure around every corner," said Brown. Other employees on the mountain help with training. Some buy clothes at thrift stores and wear them repeatedly so the fabric absorbs a human scent that's used to train the dogs. In the event of a search, there won't be time to get a lost skier's scent, so the dogs are trained generically. Dogs are not a requirement for ski patrollers, though. 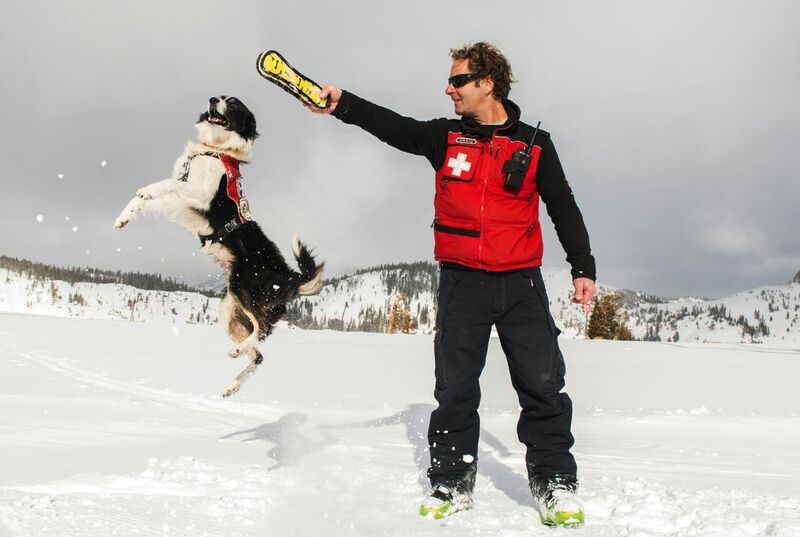 In fact, for every dog team there are six patrollers who go it alone at Squaw Alpine. And one critical part of keeping slopes safe is something dogs don't participate in: early morning rounds to identify where snow needs to be blasted off the mountain so it doesn't fall. Data was not available on how often dogs take part in avalanche searches or how often they are able to help locate victims. But the dogs don't save that many people because there aren't that many to save. A quarter of avalanche victims die from trauma before the snow stops moving and of those buried who weren't killed by trauma, half die within 20 minutes, he said. If there is a chance of rescue, though, the dogs can help, Noble said. The dogs also cut search time for remains, Logan said. Erica Mueller got to see how the Crested Butte dogs work when she volunteered to spend part of an hour in a roomy snow cave waiting to be found, armed with a radio and wearing several layers to stay warm. "I can't talk like a survivor," said Mueller, who now works as Crested Butte's director of innovations and relations, "but it was definitely a cool way to see how well trained those dogs are." Why are ski dogs so effective? Ski dogs can be so effective because their sense of smell is so good and they are easier to teach search and rescue techniques compared to people. They are affective because of their speed, they are generically trained, they can smell really well, there really isn't a reason that they wouldn't be affective. They can be so effective because they can smell really well and that could be used to find people or last things.And they learn faster and easier then people. CTQ: Ski dogs are so effective because they are able to find and rescue skiers in 30 minutes less than, say, 30 humans with poles? Ski dogs are effective because they are very fast, they can smell outstandingly, and they focus on the task at hand, not getting distracted. Ski dogs are so effective because they can track a avalanche the size of a football field in like 10 minutes, because of there super strong sense of smell and more likely to find if a person is trapped. Ski dogs are so effective because dogs are the fastest thing they have available to help them recue people. Ski dogs are so effective because of their senses they can detect an avalanche more than the size of a football field in five or 10 minutes.